The Road to Hana Maui: A Drive of a Lifetime! A Drive of a Lifetime! We had heard so much about the breathtaking beauty of the Road to Hana, Maui, that we were determined to experience it for ourselves! The drive on the highway TO Hana WAS relaxing. However, the drive FROM Hana was most definitely NOT relaxing. Consequently, I couldn't decide if this activity belonged in the relaxation section, or adventure section! 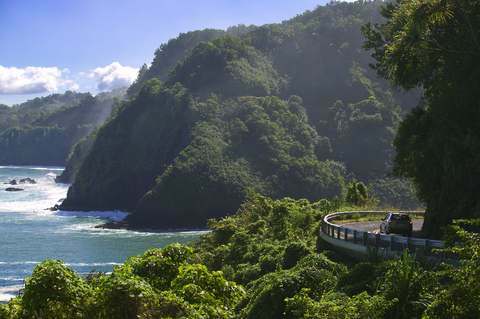 The road to Hana, Maui consists of 52 miles of winding road (perched precariously on steep cliffs, I might add), and narrow bridges: over 600 twists and turns, and over 50 bridges... almost all of the bridges are only one-lane wide! You're probably wondering why on earth anyone would want to drive on a road like THAT!! The answer is simple: some of the most awe-inspiring natural beauty you'll ever see is found on THAT road. We saw endless, lush jungle along the road, gurgling mountain streams, waterfalls and vine-covered cliffs towering above the Highway to Hana. Downwards, we saw the awesome power of the ocean, as it crashed against the rocks far, far below. As we drove, we were glad for the low speed limit on most of the Highway to Hana. The lower speeds allowed us to enjoy more of the scenery along the way, and made the hairpin turns and narrow bridges less treacherous. Many of the turns had us driving blindly around a steep curve on the cliffside. The lane was typically quite narrow - to ensure that there was enough room for potential oncoming traffic, we had to drive the car so close to the cliff's wall that the vines on the cliff actually brushed up against the car! One particularly nerve-racking moment involved squeezing past a relatively large truck that was too close to the center line when rounding one of those blind turns. There was only the narrowest of shoulders alongside the cliff. When we tried to squeeze over to allow enough room for our two vehicles to pass safely, our passenger side wheel slipped off the road! Our hearts stopped as we felt a jolt and heard the tires scraping against the edge of the road! Would we collide with the truck? Fortunately, the truck had also squeezed over more fully into its own lane, so we made it past each other in one piece! But the bone-jarring scrapes and rattles of rock against our tires freaked me out as I wondered how the return trip from Hana would be! I realize I'm not making the road to Hana, Maui, sound even remotely relaxing... but as I mentioned, we DID find the drive on the highway TO Hana relaxing (Other than our close call with that truck!) For one thing, we thoroughly enjoyed the scenery. Because the road to Hana, Maui was so LONG, I felt like this paradise-like place went on forever! What could be better than that? We didn't run into much traffic on the way there either. Not sharing the road with very many other vehicles made the journey less stressful, as we could take our time, and enjoy the sights. Occasionally, someone would come up fast behind us, riding our bumper ... we found these situations easier if we just pulled over and allowed the hurried drivers to pass. At fairly regular intervals, the road would widen enough to allow you to pull over for this purpose. We were charmed by the picturesque bridges scattered along the route. We couldn't resist pulling over at a few of them to savour the magical views! Most of the bridges were so narrow that they could only accommodate a single lane of traffic. To solve this problem, and help traffic flow more smoothly and safely, the bridges were flanked on both sides by yield signs. Traffic on one side of the bridge would stop, allowing the cars on the other side of the bridge to cross safely. Once the lineup of cars had passed, the stopped cars would proceed across the bridge. We never minded when it was our turn to stop and wait, because the scenery was so enjoyable! Have you figured out yet why the drive on the highway TO Hana WAS relaxing (well, mostly), whereas the drive FROM Hana was not? On the drive TO Hana, you have land on your side! Your lane is bordered by a wall of cliffs rising up above you, and another lane of road for oncoming traffic. On the drive FROM Hana, your lane runs along the edge of steep cliffs that drop off into either jungle, or worse, the rocky shore of the ocean far below. You have traffic on one side, and a drop to certain death on the other! This makes for a white-knuckle ride at times! There are guardrails along the most dangerous areas, but I couldn't help thinking that a measly guardrail wasn't going to help much if we were unlucky enough to be in a bad collision! One way to avoid driving the Highway to Hana in reverse is to just continue on PAST Hana and drive back to your resort via the southern route. But this option has it's own set of issues - click here for more info about driving the southern route to Hana. Anyhow, despite the ups and downs of driving the road to Hana, Maui, I'm glad we did it! The enchanting scenery along the highway to Hana made the scares we had totally worth it! The surprising thing is, I don't even LIKE driving trips, yet I loved driving the road to Hana, Maui! In fact, there is still so much that we didn't have time to stop and see along the way, that I want to take another trip along the road to Hana, Maui! I'm working on my to-do list for our next trip down this road as we speak! After reading all of this, are you thinking you'd like to try driving the Highway to Hana yourself? If so, check out my top 5 travel tips for driving the Road to Hana Maui! 1) Read about more things to do and places to stay in the Hana area here. 3) Looking for more relaxing things to do on Maui? Click here for some great ideas for THAT!